Cabinet Committee of Central Government approves the Triple Talaq Bill (Muslim Women Protection of Rights on Marriage Act) 2017 for Muslim Community. Subsequently, this bill is in accordance with the Supreme Court’s decision to make the practice of “instant” triple talaq a punishable offence. This decision of the central government is to reduce the suffering of Muslim Women and to prevent exploitation of women from teen talaq of Muslim men. 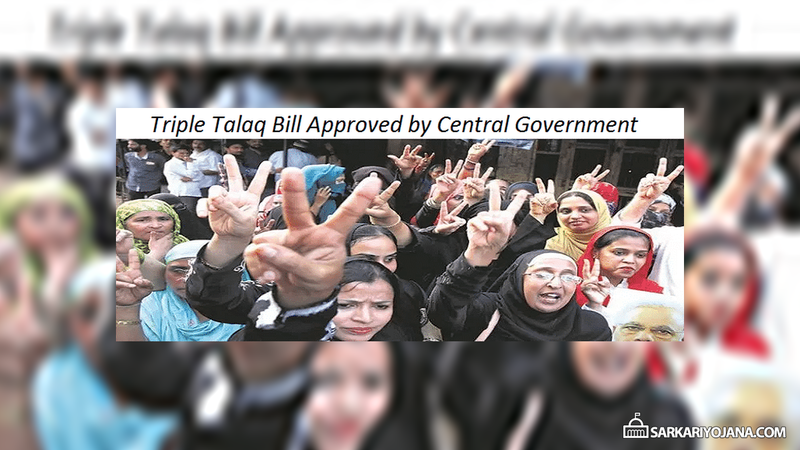 As per the provisions of the draft bill which was sent to various states earlier, there was a proposal to make triple talaq a cognisable (sangyey) and non-bailable offence. Moreover, anyone found guilty will get jail term for 3 years. Accordingly, this bill declares instant Triple Talaq as “unconstitutional” and makes it “Illegal” under Law. This bill is designed for empowerment of the women of the muslim community. As per the proposed law, instant triple talaq (talaq-e-biddat) is illegal and a punishable & non-bailable offence. Under this bill, teen talaq (talaq, talaq, talaq) in any form – spoken (oral), in writing or through any other electronic means is banned. Accordingly, muslim men cannot give talaq to their wife through e-mail, SMS or Whats-App. Henceforth, victim of the instant triple talaq can file a police complaint or approach to the magistrate to seek custody of their minor children. Moreover, muslim women can ask for maintenance from their husband. The amount of maintenance will be judged by the magistrate. Subsequently any Muslim men performing the instant teen talaq can get a jail term for 3 years. Central govt. prepares this draft law after the Supreme Court verdict of 22 August 2017 describing it as an unconstitutional act. Moreover, Supreme Court orders the central government to frame a law for this verdict in 6 months. Subsequently, central govt frames the bill and sent it to various states on 1 December 2017 for which states had to rely before 10 December 2017. Most of the states supports this draft bill. Govt. justifies the provisions of this bill as necessary steps to minimize the exploitation of women. Triple Talaq Bill will provide justice to women and helps in regaining their dignity. However, most muslim organizations are opposing this bill. They want that reforms should come from within the community as per ‘Islam’.